Fit smoke alarms on each level in your home and test them regularly. 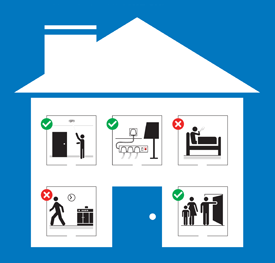 Be prepared by making a plan of escape and ensure everyone in the household knows what to do. Take care in the kitchen and never leave cooking unattended especially when cooking with hot oil. It can catch fire easily. Do not overload electrical sockets. Try and keep to one plug per socket and check for faulty frayed wiring. Be careful with candles and tea lights make sure they are secured in a proper holder and away from materials that may catch fire, like curtains. Get “key clever”. Keys for windows and doors should be kept in an easy to find place where everyone can find them. This is so you can get out in an event of a fire. Make sure everyone in the household knows where the keys are. Before bedtime check that all appliances are off, especially dishwashers and washing machines. Close all internal doors as this could stop a fire from spreading and save your life. Stub cigarettes out properly and dispose of them carefully, it’s easy to forget this when you’re tired or have drunk alcohol and never smoke in bed. Don’t leave items on charge or plugged in overnight or whilst you are out of the house and never leave plugged in and turned on when they are not in use.